Hello, BUDDY! Yup. YOU! It's good to see you! So glad you stopped by. Would you like a cupcake?! Some tea? K. Welllll.... you might have to go buy a cupcake and tea because we aren't actually physically in the same place, but if you do, let me know, and I'll go get them, too, and we can have cupcakes and tea together all over the WORLD! DUDE. That would rock. We should do that sometime, for reals, though. For. Reals. 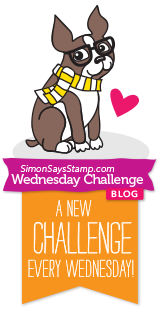 ANYWAY.... We have a new Simon Says Stamp Wednesday Challenge for you and it's probably your favorite one!!! It's ANYTHING GOES week! Woot! Woot! The Design Team is featuring both CAS-ual Fridays Stamps and Technique Tuesday products, so, naturally, I decided to use BOTH. Because I'm a fan. Of both. For reals, though. LOVE! Okay, so here's the thing. I kind of love this card. It makes me happy. That's all I can even say. Okay, not really, 'cause I'm about to say more, buy you get the idea, I'm quite sure. I created the background using the Linked Fri-Dies from CAS-ual Fridays Stamps and I super love that look. Super love. The sentiment? Yup. Totally a sticker. It's from the Simple Stories Good Day Sunshine collection and it makes me exceedingly happy. Exceedingly, folks. That's a lot of happy syllables. Okay, four, but whatevs. AND... as per usual, Heidi and the awesome team at Simon Says Stamp are offering one lucky winner a $50 Gift Voucher to the Simon Says Stamp Store! Woot! Woot! You can enter up to FIVE new creations in the challenge. FIVE, dude. Just make sure they are new and that you mention the challenge and link back. 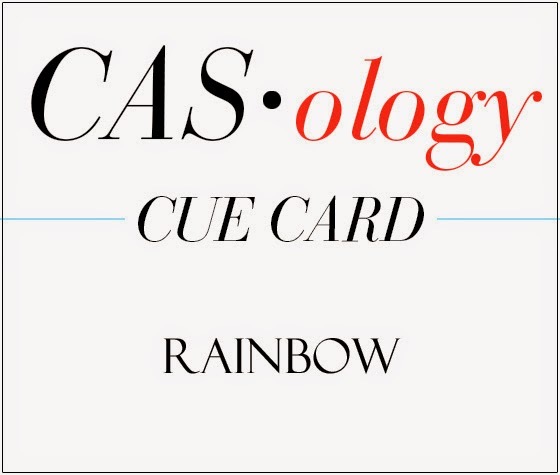 I am also entering this card in the CASology Rainbow Challenge. Because rainbow. LOVE! You can find the links to all of the products I've used on my card below. Jennifer, I absolutely LOVE this. I was positive that you embossed the designs on the top and bottom. Now, I am wanting that die set pretty bad. Love the texture from those white on white die cuts! Fantastic Jennifer, love the ink blending! 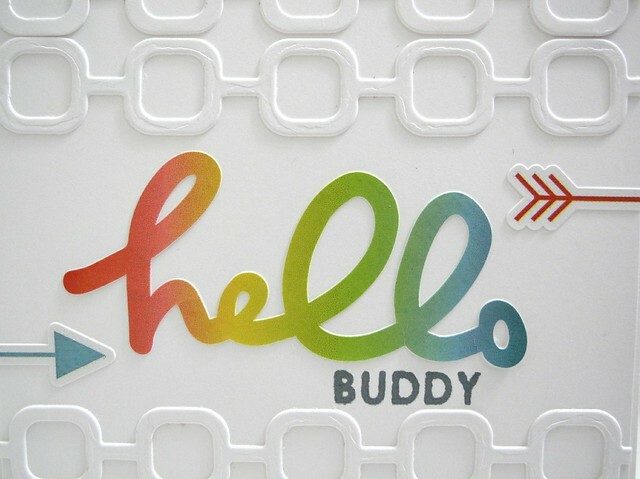 Love the white die-cuts - great texture, and the rainbow hello with the arrows - makes a wonderful graphic design, Jennifer! Great design. I love that link die. If only my pockets were as deep as my wish list is long! 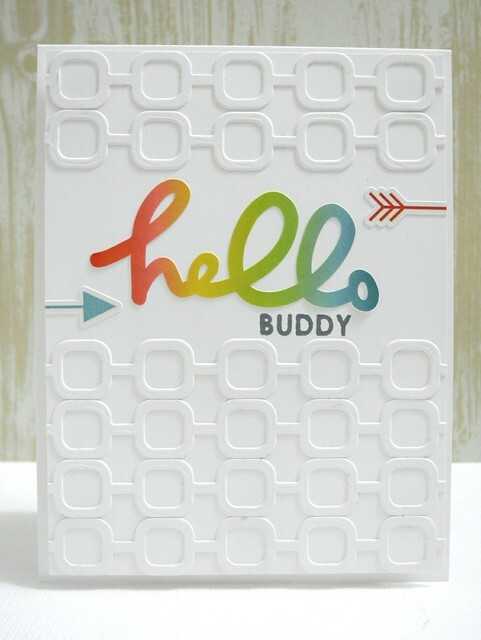 love the white on white texture of the background :) and mix of the sticker sentiment and stamped sentiment! awesome!! Amazing card Jennifer! You always have the most creative designs! Love it! A fabulous card Jennifer, I love you you've used the die cut and brilliant rainbow coloured the sentiment!! Awesome card!This card definitely makes me happy too! I love how you used a sticker for the sentiment, so cool! So sweet! Love the 'pop' of colors! Such a fun card..and I LOVE the linky texture! Love the faux-embossed look of the background and the blending of the colours on your sentiment! So glad you joined us at CASology this week! Awesome! Love the white on white die cuts - they totally make the sentiment pop. For reals! LOL! Thanks for playing along with CASology this week! hi Jingle! I luv those dies...wow...looks amazing! Hope you have a super duper fun weekend! ADORE everything about this card! The gradient of rainbow sticker is so yummy! very beautiful card, Jennifer, I love the background!!! Love your card Jennifer ! Fab sentiment, love the rainbow colours, great retro looking die too ! This card is fabulous. For reals. And you just say when you want to do cupcakes and tea all around the world and I am SO in. Thanks for joining in the fun at CASology!